Google Plus Desktop App GClient is a free Windows application to manage your Google Plus account from desktop more easily without need to login from browser. Google Plus Desktop App GClient integrates into the windows tray. Clicking on it will display a handy window showing your latest Google+ activities. 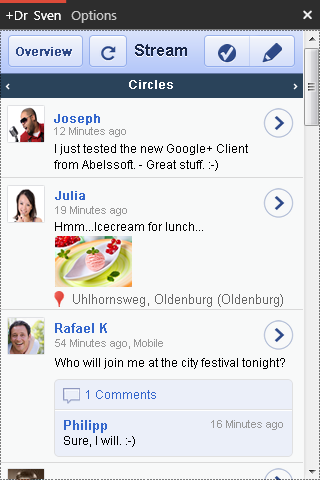 This window allows you to post messages and to follow the activity of your circles. Google Plus Desktop App GClient allows you to perform all major tasks of Google+ without having to visit the website. Screenshot and information courtesy is from official website. This Article Has Been Shared 5581 Times! Cite this article as: Abhishek Ghosh, "Google Plus Desktop App GClient : Free tool to manage Google Plus account from desktop," in The Customize Windows, July 18, 2011, April 19, 2019, https://thecustomizewindows.com/2011/07/google-plus-desktop-app-gclient-free-tool-to-manage-google-plus-account-from-desktop/.